Ottawa's newest stamp store. Dealers in Quality Stamps, Postal History & Ephemera. 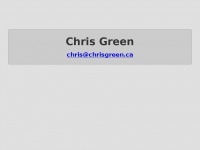 A profile of Chrisgreen.ca was found on the social network Twitter. The web server with the IP-address 158.85.79.178 used by Chrisgreen.ca is owned by SoftLayer Technologies and is located in Markham, Canada. The website Chrisgreen.ca has a own web server. The web server only runs this website. The websites of Chrisgreen.ca are hosted by a Nginx server and were developed in the programming language PHP. The HTML pages were created with the latest standard HTML 5. The website does not specify details about the inclusion of its content in search engines. For this reason the content will be included by search engines.